We saw some big scores this weekend with two WIAC teams breaking 190 for the first time this season and two NCGA-East teams breaking school records. Were these scores a reaction to a certain vault video that went viral last weekend? Maybe. 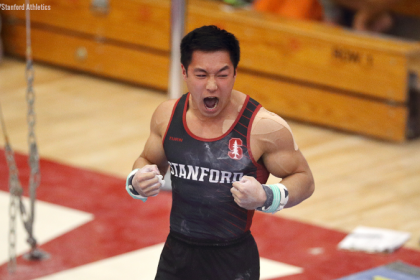 But regardless, it was exciting to see good gymnastics getting big scores that we don’t see too often in DIII. Also, speaking of a certain viral vault video, we wanted to give a shoutout to Stephanie Mager of Brockport who also competed a Yurchenko 1.5 for the first time last weekend and Brockport alum Lauren Gildemeyer who competed a Yurchenko tucked 1.5 back in 2010. After suffering a concussion earlier this season, McConnell returned to competition last weekend and hit an incredible bar routine. She followed it up this weekend with a big win in a tough field that included conference rivals Brockport and Ithaca. In the uproar surrounding Shadae Boone’s vault, Mager’s success got a bit lost in the shuffle. 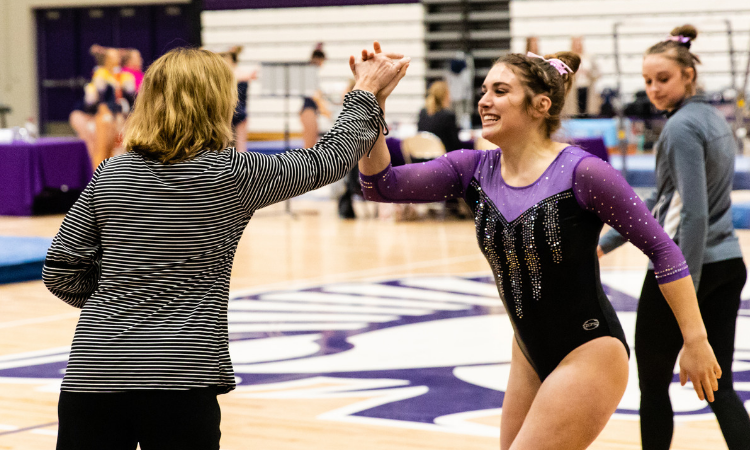 It should be known that she also competed and hit a Yurchenko 1.5 last weekend and followed it up with another successful vault in the team’s meet against Ithaca and Cortland. 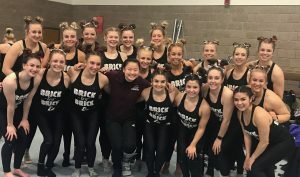 The entire UW-L gymnastics team wore Peng-Peng-esque buns for its meet against Gustavus this past Friday. The Big Storyline: In the final regular season meet, the Bears fielded a full lineup on every event and scored a season high. The team honored its seniors Matisen O’Brien and Lindsay Rush who both had great days. 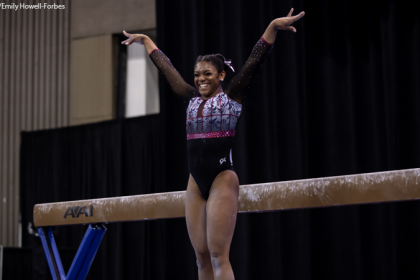 Rush contributed the team’s top score on vault and bars, and O’Brien hit solid sets on both beam and floor. The Big Storyline: After falling to Ithaca last weekend, Brockport put up a much better meet and took the win. The meet concluded almost exactly how we would have expected it to with the only small surprise being Cortland finishing closer to Ithaca than Ithaca to Brockport. This finish for the Red Dragons definitely helps keep them in the national qualifier conversation as a potential threat to Springfield for the third spot. The Big Storyline: The Blue Devils bounced back from their first conference loss last weekend with a nearly five-point win against the Blugolds. Mikala Bugge continues to shine in the all around putting her in solid contention for a title at the upcoming conference championship. Hannah Lewis earned the Blugold’s sole title this weekend, but they had plenty of other great performances, including a beautiful Tsuk tuck full from Victoria Perron. Implications: Some higher scores around the conference this weekend forced UW-Stout down to No. 2 in the DIII WIAC rankings behind UW-Oshkosh. The Big Storyline: Five school records were broken at this meet—Springfield broke four and Rhode Island one. Though Springfield obviously had a stellar meet and claimed all the titles, there’s something to be said about this Rhode Island team. The Anchorwomen have improved greatly this year, breaking a total of five school records throughout the season and maintaining an SAS over 180 for the first time in at least the last three seasons. Their performance here was no exception as they improved their team score over last week by five points. Implications: The top three teams in the NCGA-East have all broken 190 now, so we could see some big scores at the conference championship next weekend. Records: Rhode Island broke its team record by one and a half points. Springfield broke its team, beam, floor and all around records. The Big Storyline: Just a few weeks ago the Gusties came within a point of UW-Stout, and this week they came out just over a point and a half behind UW-La Crosse—an extremely solid finish that should boost their confidence heading into the conference championship next weekend. On the other hand, La Crosse had a slightly rough meet. 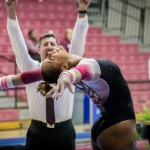 Though the Eagles scored season highs on both bars and floor, they had to count multiple falls on vault and beam. Implications: La Crosse dropped in the DIII rankings, falling from No. 4 to No. 7. The Big Storyline: In a case of what seems like déjà vu, UW-Oshkosh took down UW-Whitewater for the third week in a row. Both of these teams also became the first WIAC teams to break 190 this season with the Titan’s 191.850 crushing the previous school record. UW-O also continues to impress on beam, scoring an impressive 48.450, which looks like it could be a school record as well. UW-W had a great day and has really improved since the beginning of season, becoming much more consistent on bars and beam. Implications: After three strong weeks, UW-Oshkosh snuck into the top spot in the WIAC and is No. 3 in the DIII rankings. UW-Whitewater moved ahead of UW-La Crosse, sitting in the third spot in the WIAC heading into conference next weekend. Records: UW-Oshkosh broke its team record and possibly its beam record. The Big Storyline: Neither of these teams could have really asked for a better ending to the regular season. This was a huge season high for Winona, crushing its previous season high by over four points. Hamline also had a great score, and although it wasn’t a season high, it was the highest score the team has reached at an in-conference meet this year by over three points. Implications: Both teams jumped two spots in the DIII rankings with Hamline now ranked No. 9 and Winona No. 11.